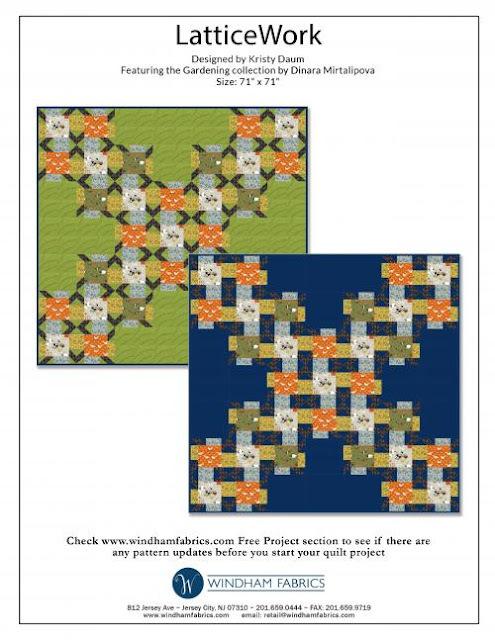 In going through my drafts folder, I realized that I neglected to post about this pattern that I created for Windham Fabrics. It uses the Gardening collection by Dinara Mirtalipova; which is currently available at retail. While, it is one of the more complex patterns that I have written due to the amount of pieces and overall look of the block, I would still consider it something for an Advanced Beginner to tackle. I named it LatticeWork; as the quilt looks like a zoomed in image of lattice; which also relates to landscaping, gardening, so on and so forth. I like it. Its is different from your usual, but still has a mod feel. Interesting how the diagonals disappear due to contrast in the blue version. Looks like different pattern.